Linda Toshiko Nakamoto passed peacefully at 83-years-old on March 18, 2019 surrounded by family. Toshiko, as she was lovingly known, was born in Yonabaru, Okinawa on February 4, 1936 to Denjiro and Yone Uehara, 3rd oldest of 8 children. She came to Hawaii in 1962 and attended Hawaii Mission Academy ESL Classes. Toshiko worked at a family friend’s business called Island Slippers. Her last job was at ABC Stores as a customer service representative. She made many friends because she loved conversing with people. Toshiko took odori classes at Hooge Ryu Hana Nuuzi no Kai Nakasone Dance Academy for over 30 years. She was also a member of Yonabaru Chojin Kai, Deigo Club, Paranku Club, Karaoke classes with Marion Arakaki, and an Okinawan Karaoke Club. 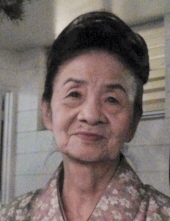 Toshiko loved to dance at bon dances; the Okinawan songs were her favorite. Toshiko shared her love for odori with her daughters and granddaughters. They all took classes from the Nakasone Dance Academy and her daughters Sheryl and Janet even took Paranku with Toshiko. Toshiko was a great cook! She was famous for her konbu make, shoyu pork, tofu umbasa and ANDAGI! People have been known to offer her money for her recipe but she never shared it because it wasn’t written down. It was all done by memory, touch, taste and “the eye” to measure ingredients. Toshiko was known as “Andagi Mama”! Toshiko is predeceased by parents Denjiro and Yone Uehara, brothers Yoshihide, Yoshiteru, and Yoshio Uehara of Okinawa, and sister Yoneko Bounds of Arizona. She is survived by husband, George Nakamoto, son Glenn Nakamoto of Kauai, daughters Gail Tamaribuchi (Paul), Sheryl Nakamoto, Janet Scott (Jimmy) of Honolulu, grandchildren Ryan, Tryslynn, Kryslynn, Chayla, Angela, Sara, Koa, brother Yoshimitsu Uehara of Honolulu, sisters Mitsuko Kaneshiro of Honolulu, Kimiko Uehara of Okinawa, and numerous nephews and nieces. Visitation is at 4pm, services are at 5pm at Nuuanu Memorial Park and Mortuary on April 21, 2019. To send flowers or a remembrance gift to the family of Linda Toshiko Nakamoto, please visit our Tribute Store. "Email Address" would like to share the life celebration of Linda Toshiko Nakamoto. Click on the "link" to go to share a favorite memory or leave a condolence message for the family.